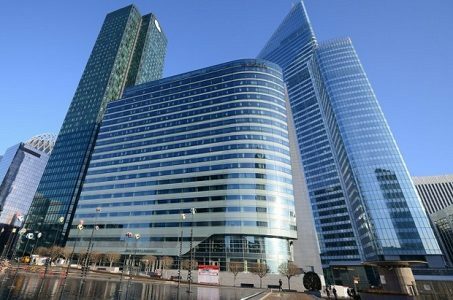 Melia Hotels International is sporting a new address in Paris’ financial district, La Defense. La Defense sits to the west of the city, rising high above the traditional, white stone architecture with modern skyscrapers and sleek designs. Though not officially part of Paris proper, La Defense is less than a 10-minute Metro ride from some of the city’s most iconic destinations. The Melia Paris La Defense sits near the Esplanade de La Defense Metro stop along the No. 1 line, which takes tourists directly to the major points of interest, such as the Champs-Elysees, Arc de Triomphe, Eiffel Tower, the Louvre and the Tuileries Garden. The hotel is a short hop to anywhere travelers would want to be and offers rooms starting at $200 a night. The hotel itself is an all-glass, sail-shaped building that overlooks the city. Most rooms have expansive windows where guests can observe the city’s skyline, with the Eiffel Tower visible in the distance. The 369 rooms, including 29 suites, are spread across 18 floors. To read more at Travel Weekly, click here.